The New Duncan Genuine Hat has a very clean, modern look. The 'Genuine Duncan Yo-Yo' Logo is stitched in white on a black hat, offset at an angle on the front of the hat. The Duncan Logo is printed on the back of the hat and there is even a very cool Duncan comic strip design printed under the brim! Duncan created the Genuine Hat using a high quality, New Era 59Fifty, Fitted Hat to guarantee a great look and a perfect fit. 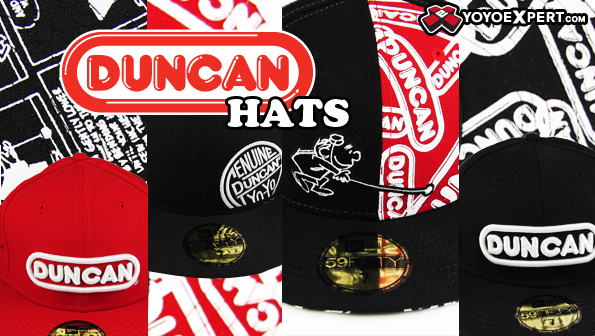 So support the original yo-yo company and show some Duncan pride with the Duncan Genuine Hat! To figure out your cap size, measure around your head with a flexible tape directly where the hat band will rest. Match the measurement to cap size in the sizing chart.